Here’s what’s coming up in North Bay over the next few weeks! Top Picks Auto Sales are having a huge sale on all trucks, cars, and vans from February 1st to February 3rd. Every vehicle in the lot will be anywhere from 20% to 50% off. Friendly, helpful staff will be on hand to answer all of your questions. As a special bonus, all previously owned vehicles will come with a complimentary fire extinguisher and Burn Relief First Aid kit. Temperatures will continue to stay low, with at least three more days of -25 or colder weather. Despite all this, that one chubby guy at the bus stop will continue to wear cargo shorts and sneakers. We get it Kevin: you don’t care about the cold. Now please put some pants on. On Saturday, a Yellow Vest Protest will be taking place outside City Hall. The Yellow Vest Protest is a nation-wide rally against the current Trudeau government, Canada’s carbon tax, and modern immigration policies. 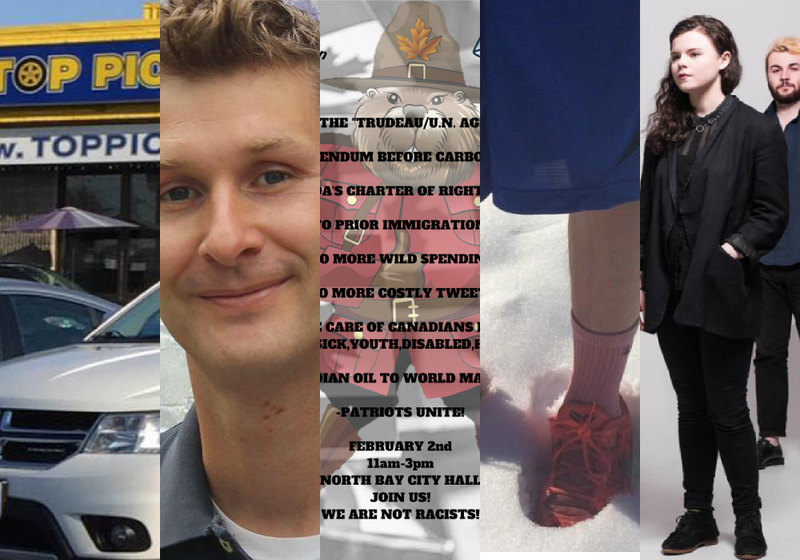 North Bay’s Yellow Vest Protest would like to let everyone know that THEY ARE NOT RACISTS. Protest is at 2pm. White bed sheets provided. On February 8, Aerialists will be in North Bay to play Churchills. Nominated for a Canadian Folk Music Award for “Emerging Artist of the Year,” Aerialists meld their ferociously creative harmonic sensibilities and deep love for folk traditions into a post-rock coloured sound called prog-trad. The group has toured a whole bunch and wrote in asking us nicely to promote them. So, you know, they seem pretty cool. City Councillor Scott Robertson will be hosting a Facebook Live Q&A on Tuesday, January 29th at 7 pm. Having just returned from an emergency trip to Australia, Scott will be speaking publicly for the first time since missing a City Council meeting. That doesn’t change the fact that he’s probably more tan than 90% of North Bay right now, and for that we hate him a little. Still, he’s one of the few Councillors that seem to really care what the regular people of North Bay think, and for that, we’re willing to look past his incredible, healthy tan. Do you know of any events coming up in North Bay soon? Do you have an extra ticket to somewhere warm and rum-filled? Send us a message and let us know!